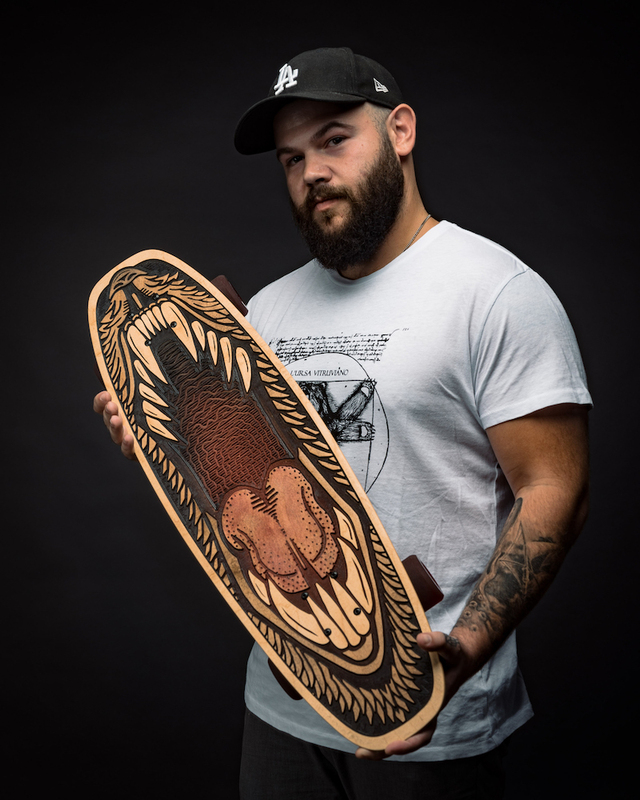 Graphic communications major-turned-custom skateboard maker, Bear Walker reveals his creative process. 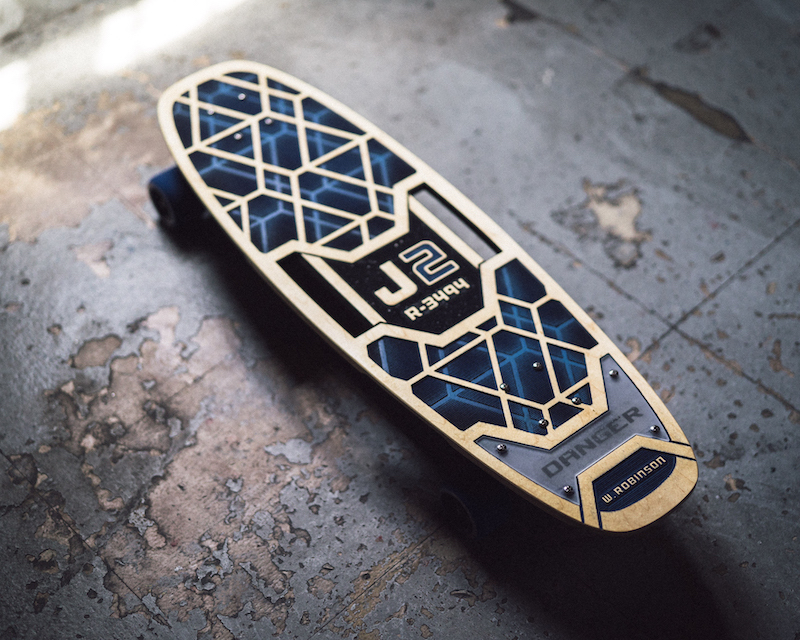 Q: HOW DID YOU GET INTO MAKING CUSTOM SKATEBOARDS? A: I got my degree from Clemson in graphic communications, and for one of my projects, I actually chose to design a skateboard. After that, I didn’t touch anything skateboard-related for a few years. I became a prop master at a special rims company and then a fabricator at a custom sign shop. When I was carving out a custom sign one day, I thought it would make a pretty cool grip for a skateboard, so I tried it and made one. People started asking me where I got it from, and I started taking orders. It just grew from there. Q: IS THERE A LESSON OR MEMORY FROM CLEMSON THAT STICKS WITH YOU? A: My favorite stuff at Clemson was the printing projects, and that meant you were going to be in lab for, like, your entire life. But it was the fun part. That kind of translated to my career. If you’re going to do something more fun as an occupation, it’s going to be a lot more work because most of the time, passion projects aren’t necessities. Like if someone’s breaker goes out, they have to call an electrician to get a new breaker, but I have to convince someone to buy a skateboard. Q: HOW MANY SKATEBOARDS DO YOU MAKE IN A DAY? A: If I’m doing stock orders, I can make six. If I’m working on a custom, it’ll probably just be that one. Q: HOW DO YOU STAY MOTIVATED WHEN YOU’RE WORKING LONG HOURS? A: I do get burnt out every once in a while, but then I’ll do a custom for a client, and they’ll request something I’ve never done before. I’ll try it out and figure out new ways to carve, which brings so many new possibilities for other projects. That’s what keeps me inspired. I know the more I do this, the crazier and better stuff I can come up with. Q: WHAT’S YOUR ADVICE FOR RECENT GRADS? A: Be susceptible to change. If you have a really good idea of what you want to do, that’s awesome — kudos to you. But if you’re not 100 percent set in your career path, don’t be afraid to take opportunities you didn’t quite have in mind to begin with. Sometimes, you get into a job or get offered an opportunity, and it completely changes your mindset for where you want your life to go.